Strale SpA, baised in Turin and founded by the man behind the Strale Daytona sports car was Eduardo Martini, an aeronautical engineer. 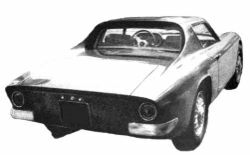 At the 1966 Italian Grand Prix he presented his new GT coupe, which was an attractive short-nosed 2-seater intended for road use and Group 4 racing. It featured a 6.3-litre Chrysler V8 of up to 431 bhp mounted at the front, a 4-speed gearbox and all-independent suspension featuring De Dion rear axle, and the company claimed a 180mph (290 km/h) top speed. 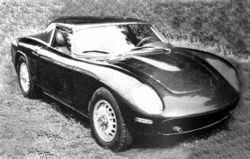 The bodywork was designed by Carlo Bernasconi and was realized in aluminum and fiberglass by Neri & Bonacini of Modena. A more luxurious Grey Flash version was also produced.